"Indian Blood" redirects here. For ethnic Indians of the Indian subcontinent of South Asia, see ethnic Indian. For ethnic aboriginals of the Americas, see Indigenous peoples of the Americas. For the play by A. R. Gurney, see Indian Blood (play). "blood quantum" redirects here. For the CSI novel, see CSI: Blood Quantum. For other topics, see blood purity (disambiguation). This article is about United States laws defining Native American identity by ethnic ancestry. For restrictive laws related to black African ancestry, see One-drop rule. For Nazi Germany laws concerning ethnicities, see Racial policy of Nazi Germany. Blood quantum laws or Indian blood laws are those enacted in the United States and the former colonies to define qualification by ancestry as Native American, sometimes in relation to tribal membership. It ignored the Native American practices of absorbing other peoples by adoption, beginning with other Native Americans, and extending to children and young adults of European and African ancestry. It also ignored tribal cultural continuity after tribes had absorbed such adoptees and mixed-race children. A person's blood quantum (aka BQ) is defined as the percentage of their ancestors, out of their total ancestors, who are documented as full-blood Native Americans. For instance, a person who has one parent who is a full-blood Native American, and one who has no Native ancestry, has a blood quantum of 1/2. Since re-establishing self-government and asserting sovereignty, some tribes may use blood quantum as part of their requirements for membership or enrollment, often in combination with other criteria. For instance, the Omaha Nation requires a blood quantum of 1/4 Native American and descent from a registered ancestor for enrollment. In 1705 the Colony of Virginia adopted laws that limited civil rights of Native Americans and persons of one-half or more Native American ancestry. The concept of blood quantum was not widely applied by the United States government until the Indian Reorganization Act of 1934. At that time, the government required persons to have a certain blood quantum in order to be recognized as Native American and to be eligible for financial and other benefits under treaties or sales of land. Since that time, however, Native American nations have re-established their own governments, asserting sovereignty in setting their own rules for tribal membership, which vary among them. In some cases, individuals may qualify as tribal members, but not as American Indian for the purposes of certain federal benefits, which are still defined in relation to blood quantum. In the early 21st century some tribes tightened their membership rules and excluded persons who had previously been considered members, as have the Cherokee and Wampanoag. Challenges to such policies have been pursued by those excluded. European Americans passed "Indian Blood law" or blood quantum law to regulate who would be classified as Native American. The first such law was passed in 1705 in the Colony of Virginia, to define Native Americans and to restrict the civil rights of people who were half or more Native American. In the 19th and 20th centuries, the US government believed tribal members had to be defined, for the purposes of federal benefits or annuities paid under treaties resulting from land cessions. Many Native American tribes did not use blood quantum law until the government introduced the Indian Reorganization Act of 1934. Some tribes, such as the Navajo Nation, did not adopt the type of written constitution suggested in that law until the 1950s. given intermarriage among tribes, particularly those that are closely related and have settled near each other, critics object to the federal requirement that individuals identify as belonging to only one tribe when defining blood quantum. They believe this reduces individual's valid membership in more than one tribe, as well as costing some persons qualification as Native American, because of having ancestry from more than one tribe, but not 1/4 or more from one tribe. Overall, the numbers of registered members of many Native American tribes have been reduced because of federal laws. "The U.S. census decennial enumerations indicate a Native American population growth for the United States that has been nearly continuous since 1900 (except for an influenza epidemic in 1918 that caused serious losses), to 1.42 million by 1980 and to over 1.9 million by 1990." In the 2000 census, there were 2.5 million American Indians. Since 1960, people may self-identify their ancestry on the US Census. Indian activism and a rising interest in Native American history appear to have resulted in more individuals identifying as having Native American ancestry on the census. For decades, individual tribes have established their own requirements for membership. In some cases, they have excluded members who had long been part of the tribe. Common tribal membership requirements require documented lineal descent from a Native American member listed on the Dawes Rolls, or an early 20th-century census; in some cases they may also require a certain percentage of Native American ancestry, and demonstrated residence with a tribe or commitment to the community. Unlike the provisions of the Indian Reorganization Act, many tribes allow members to claim ancestry in more than one tribe. For instance, the Little Traverse Bay Bands of Odawa Indians accept persons of 1/4 North American Indian ancestry, plus documented descent from an ancestor listed in specific records. In part, this recognizes that the Odawa people historically had a territory on both sides of what is now the border between the US and Canada. Each federally recognized tribe has established its own criteria for membership. Given the new revenues that many tribes are realizing from gambling casinos and other economic development, or from settlement of 19th-century land claims, some have established more restrictive rules to limit membership. In 2007 the Cherokee Nation voted in the majority to exclude as members those Cherokee Freedmen who had no documented ancestors on the Cherokee-by-blood list of the Dawes Rolls. But, the Cherokee Supreme Court ruled in 2005 that they were legitimate members of the tribe at that time. After the Civil War, the US required the Cherokee and other Indian tribes that had supported the Confederacy to make new treaties. They also required them to emancipate their slaves, and to give full tribal membership to those freedmen who wanted to stay in tribal territory. The Cherokee Freedmen often had intermarried and some had Cherokee ancestry at the time of the Dawes Rolls, qualifying as Cherokee by blood, but registrars typically classified them as Freedmen; registration was often inaccurate. Similarly, in 2000, the Seminole Nation of Oklahoma attempted to exclude two bands of Seminole Freedmen from membership to avoid including them in settlement of land claims in Florida, where Seminole Freedmen had also owned land taken by the US government. Since 1942, the Seminole have at times tried to exclude Black Seminoles from the tribe. The freedmen were listed separately on the Dawes Rolls and suffered segregation in Oklahoma. More recently, the Seminole refused to share with them the revenues of 20th-century US government settlements of land claims. The Center for Constitutional Rights has filed an amicus brief, taking up the legal case of the Black Seminoles and criticizing some officials of the Bureau of Indian Affairs for collaborating in this discrimination by supporting tribal autonomy in lawsuits. By treaty, after the American Civil War, the Seminole were required to emancipate slaves and provide Black Seminoles with all the rights of full-blood Indian members. "American Indian tribes located on reservations tend to have higher blood quantum requirements for membership than those located off reservation....[reference to table] [O]ver 85 percent of tribes requiring more than a one-quarter blood quantum for membership are reservation based, as compared with less than 64 percent of those having no minimum requirement. Tribes on reservations have seemingly been able to maintain exclusive membership by setting higher blood quanta, since the reservation location has generally served to isolate the tribe from non-Indians and intermarriage with them. Many Native Americans have become used to the idea of "blood quantum". The blood quantum laws have caused problems in Native American families whose members were inaccurately recorded as having differing full or partial descent from particular tribes. In some cases, family members or entire families have been excluded from being enrolled as members of their tribe even when they have no non-Native American ancestors. At certain times, some state governments classified persons with African American and Native American admixture solely as African American, largely because of racial discrimination related to slavery history. This was prevalent in the South after Reconstruction, when white-dominated legislatures imposed legal segregation, which classified the entire population only as white or colored (Native Americans, some of whom were of mixed race, were included in the latter designation). It related to the racial caste system of slavery before the American Civil War. Until 1870 there was no separate classification on the census for Indian. 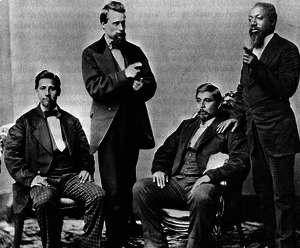 The Lumbee, a group that appeared to organize from a variety of free people of color on the North Carolina frontier in the 19th century, achieved state recognition as Croatan Indian in 1885 after Reconstruction. This separate status allowed them to establish a school system for their children distinct from that for freedmen's children. The question of identity is complex. Award-winning researcher Paul Heinegg and Dr. Virginia DeMarce found that ancestors of 80 percent of free people of color (including individuals on the census later claimed as Lumbee ancestors) in the 1790 and 1810 censuses on the North Carolina frontier were descended from families of white women and African men, and were free in colonial Virginia because of the mother's status. Many mixed-race people in frontier areas identified as Indian, Portuguese or Arab to escape racial strictures. In 1952 the Croatan Indians voted to adopt the name of Lumbee. (They were settled near the Lumber River, also called the Lumbee.) They achieved limited federal recognition in 1956 as an ethnic Indian nation by a special act of the US Congress, and accepted at the time that it was without benefits. Since then, they have tried to appeal to Congress for legislation to gain full federal recognition. Their effort has been opposed by several federally recognized tribes. In 1924 Virginia passed the Racial Integrity Act, which required that every individual be classified as either white or black. (Some other states adopted similar laws.) In application, the law was enforced to the standard of the "one drop rule": individuals with any known African ancestry were classified as black. As a result, in the censuses of the 1930s and the 1940s, particularly in the South's segregated society, many people of African American and Native American descent who were either biracial or multiracial were largely classified as black, even though they identified culturally as Native American. The result negatively affected many individuals with mixed African American and Native American descent. Because there are few reservations in the South, such individuals needed to provide evidence of ancestry to be enrolled in a tribe. The changes in historic records erased their documentation of continuity of identity as Indian. During the early years of slavery, some Native Americans and Africans intermarried because they were enslaved at the same time and shared a common experience of enslavement. Others made unions before slavery became institutionalized, as they worked together. Today, the proposed regulations for children adopted into Native families are that they are unable to be federally recognized members unless they have a biological parent who is enrolled in a tribe. Such cases of adoption are probably less frequent than in the past. Historically, especially recorded during the colonial years and the 19th century in the American West, many tribes adopted young captives taken in war or raids to replace members who had died. Whether European or of another Native American tribe, the captives generally were fully assimilated into the tribal culture and were considered full members of the tribe. Generally, they remained with the tribe, marrying other members and rearing their children within the cultural tradition. In some cases, census rolls for tribes such as the Cherokee were incomplete due to intermarriage, immigration, treaties, or because the members were not living within the boundaries of the nation, and thus would not be recorded on the census. As noted above, however, many people have identified as Native American on the US Census but are not eligible for tribal enrollment. Some critics argue that blood quantum laws helped create racism among tribal members. The historian Tony Seybert contends that was why some members of the so-called Five Civilized tribes were slaveholders. The majority of slave owners were of mixed-European ancestry. Some believed they were of higher status than full-blood Indians and people of African ancestry. Other historians contend that the Cherokee and other tribes held slaves because it was in their economic interest and part of the general southeastern culture. Cherokee and other tribes had also traditionally taken captives in warfare to use as slaves, although their institution differed from that which developed in the southern colonies. No federally recognized tribe enrolls members solely based on DNA testing, as it generally cannot distinguish among tribes. Some tribes may require DNA testing only to document that a child is related to particular parents. Many researchers have published articles that caution that genetic ancestry DNA testing has limitations and should not be depended on by individuals to answer all their questions about heritage. Historian Sherrel Wheeler Stewart says that most African Americans have Native American ancestry. Some critics thought the PBS series African American Lives did not sufficiently explain such limitations of DNA testing for assessment of heritage. In terms of persons searching for ethnic ancestry, they need to understand that Y-chromosome and mtDNA (mitochondrial DNA) testing looks only at "direct" line male and female ancestors, and thus can fail to pick up many other ancestors' heritage. Newer DNA tests can survey all the DNA that can be inherited from either parent of an individual, but at a cost of precision. DNA tests that survey the full DNA strand focus on "single nucleotide polymorphisms" or SNPs, but SNP might be found in Africans, Asians, and people from every other part of the world. Full survey DNA testing can not accurately determine an individual's full ancestry. Many Native American tribes continue to employ blood quantum in current tribal laws to determine who is eligible for membership or citizenship in the tribe or Native American nation. These often require a minimum degree of blood relationship and often an ancestor listed in a specific tribal census from the late 19th century or early 20th century. The Eastern Band of Cherokee Indians of North Carolina, for example, require an ancestor listed in the 1924 Baker census and a minimum of 1/16 Cherokee blood inherited from their ancestor(s) on that roll. Meanwhile, the Cherokee Nation requires applicants to descend from an ancestor in the 1906 Dawes roll (direct lineal ancestry), but does not impose minimum blood quantum requirement. The United Keetoowah Band requires a minimum 1/4 blood quantum. The Ute require a 5/8 blood quantum, the highest requirement of any American tribe. The Miccosukee of Florida, the Mississippi Choctaw, and the St. Croix Chippewa of Wisconsin all require one-half "tribal blood quantum", also a high percentage. At the other end of the scale,some tribes, such as the Kaw Nation, require 1/32 degree blood quantum, which corresponds to having one fullblood great-great-great-grandparent. Many tribes, such as Alabama-Quassarte Tribal Town and the Wyandotte Nation, require an unspecified amount of Indian ancestry (known as "lineal descendancy") documented by descent from a recognized member. Others require a specified degree of Indian ancestry but an unspecified share of ancestry from the ancestral tribe or tribes from which the contemporary tribal entity is derived, such as the Grand Traverse Band of Ottawa and Chippewa Indians and the Poarch Band of Creek Indians. Many tribes today are confederations of different ethnic groups joined into a single political entity making the determination of blood quantum challenging. Other tribes require a minimum blood degree only for tribal members born "off" (outside) the nominal reservation. This is a concept comparable to the legal principles of Jus soli and Jus sanguinis in the nationality laws of modern sovereign states. These tribes do not have a minimum blood quantum requirement, but members must be able to document descent from original enrollees of tribal rolls. These tribes require both a specified blood quantum and lineal descent from an individual on a designated tribal roll. Confederated Tribes of the Umatilla Indian Reservation – Since 1993, have required 1/4 descent from any federally recognized Native American tribe, plus being the biological child or grandchild of an already-enrolled member. Native American populations increased considerably during the 20th century. Increasing urbanization and intermarriage may affect their futures as distinct peoples tied to geographic areas. Nations with high blood quantum requirements may have to change their rules for tribal membership or see their numbers decrease. Each tribe will deal with the issue in its own way, likely related to the size of its reservation, urbanized population, economic development, extent of cultural revival, etc. 1 2 3 4 5 Professor Jack D. Forbes (2008). "THE BLOOD GROWS THINNER :BLOOD QUANTUM, PART 2". University of California-Davis. Retrieved 2009-08-07. ↑ Paul Spruhan (2001). "A Legal History of Blood Quantum in Federal Indian Law to 1935". Social Science Electronic Publishing, Inc. Retrieved 2009-08-07. 1 2 3 4 5 Russell Thornton (2008). "Tribal Membership Requirements and the Demography of "Old" and "New" Native Americans". The National Academic Press. Retrieved 2009-09-02. 1 2 3 Paul Spruhan (2008). "THE ORIGINS, CURRENT STATUS, AND FUTURE PROSPECTS OF BLOOD QUANTUM AS THE DEFINITION OF MEMBERSHIP IN THE NAVAJO NATION" (PDF). Tribal Law Journal. Retrieved 2009-08-15. ↑ Evans, Ben. "Dems ask DoJ to probe treatment of Indian freedmen." Indian Country Today, 8 May 2009 (retrieved 20 April 2010) Archived May 22, 2009, at the Wayback Machine. 1 2 Jeff Fogel; Barbara Olshansky & Shayana Kadidal (2008). "CCR Files Amicus Brief on Behalf of Black Seminoles". Center for Constitutional Rights. Retrieved 2009-08-15. ↑ Christina Berry (2008). "Blood Quantum - Why It Matters, and Why It Shouldn't". All Things Cherokee, personal website. Archived from the original on June 10, 2009. Retrieved 2009-09-07. 1 2 3 4 Karen I. Blu (1980). The Lumbee problem: the making of an American Indian people. University of Nebraska. Retrieved 2009-08-15. 1 2 3 G. Reginald Daniel (2002). More than Black? : multiracial identity and the new racial order. Temple University Press. Retrieved 2009-09-01. ↑ National Park Service (2009-05-30). "Park Ethnography: Work, Marriage, Christianity". National Park Service. ↑ Christina Berry (2008). "I Know I'm Cherokee, But How Do I Prove It?". All Things Cherokee, personal website. Archived from the original on April 10, 2009. Retrieved 2009-09-07. ↑ Tony Seybert (2009). "Slavery and Native Americans in British North America and the United States: 1600 to 1865". New York Life. Archived from the original on 2004-08-04. Retrieved 2009-06-20. ↑ William Loren Katz (2008). "Africans and Indians: Only in America". William Loren Katz. Archived from the original on May 13, 2008. Retrieved 2008-09-20. 1 2 Brett Lee Shelton; J.D. and Jonathan Marks (2008). "Genetic Markers Not a Valid Test of Native Identity". Counsel for Responsible Genetics. Retrieved 2008-10-02. ↑ ScienceDaily (2008). "Genetic Ancestral Testing Cannot Deliver On Its Promise, Study Warns". ScienceDaily. Retrieved 2008-10-02. 1 2 Troy Duster (2008). "Deep Roots and Tangled Branches". Chronicle of Higher Education. Retrieved 2008-10-02. 1 2 "DNA Testing: review, African American Lives, About.com". Archived from the original on March 13, 2009. ↑ "African American Lives 2". ↑ Sherrel Wheeler Stewart (2008). "More Blacks are Exploring the African-American/Native American Connection". BlackAmericaWeb.com. Archived from the original on 2006-10-31. Retrieved 2008-08-06. 1 2 "Constitution of the Kaw Nation." Kaw Nation. 2011. Retrieved 30 April 2012. 1 2 3 4 5 6 7 8 9 10 11 12 13 14 15 16 17 18 19 20 21 22 23 24 25 26 27 28 29 30 31 32 33 34 35 36 37 38 "Pocket Pictorial." Oklahoma Indian Affairs Commission. 2010. (retrieved 10 June 2010) Archived April 6, 2010, at the Wayback Machine. ↑ "Constitution of the Poarch Band of Creek Indians." Native American Rights Fund. 1 June 1985 (retrieved 25 Nov 2010) Archived November 28, 2008, at the Wayback Machine. ↑ "CONSTITUTION AND BYLAWS OF THE CHIPPEWA CREE INDIANS OF THE ROCKY BOY'S RESERVATION MONTANA". thorpe.ou.edu. ↑ "CONSTITUTION AND BY-LAWS OF AK-CHIN (PAPAGO) INDIAN COMMUNITY" (PDF). nptao.arizona.edu. ↑ "Constitution and By-Laws For the Blackfeet Tribe Of The Blackfeet Indian Reservation of Montana". thrope.ou.edu. ↑ Confederated Tribes of the Chehalis Reservation, Human and Natural Resources. United States Bureau of Indian Affairs. ↑ "Constitution of the Kickapoo Traditional Tribe of Texas." Native American Constitution and Law Digitization Project. Retrieved 13 Sept 2013. ↑ "Member Services." Prairie Band Potawatomi Nation. (retrieved 2 Feb 2011) Archived November 26, 2010, at the Wayback Machine. ↑ "Enrollment Ordiance." Utu Utu Gawitu Paiute Tribe. (retrieved 5 May 2010) Archived July 7, 2011, at the Wayback Machine. ↑ "Constitution and By-Laws of the Agua Caliente Band of Cahuilla Indians". thorpe. ou.edu. ↑ "Fort Independence Articles of Association." National Indian Law Library. Retrieved 2 July 2012. Archived January 7, 2013, at the Wayback Machine. ↑ "CONSTITUTION AND BY-LAWS * " OF THE ALABAMA AND COUSHATTA TRIBES OF TEXAS" (PDF). thorpe.ou.edu. ↑ Professor Laurence M. Hauptman. "A Review" of Jeff Benedict’s Without Reservation: The Making of America’s Most Powerful Indian Tribe and Foxwoods, the World’s Largest Casino], Indian Gaming, 17 March 2009 Archived October 12, 2008, at the Wayback Machine. ↑ "Chapter 2, Section 2.01: Enrollment Criteria" (PDF). Enrollment Code of the Confederated Tribes of the Umatilla Indian Reservation. July 7, 2014. Retrieved May 15, 2015.